Synopsis: In RoboCop, the year is 2028 and multinational conglomerate OmniCorp is at the center of robot technology. Overseas, their drones have been used by the military for years – and it’s meant billions for OmniCorp’s bottom line. Now OmniCorp wants to bring their controversial technology to the home front, and they see a golden opportunity to do it. When Alex Murphy (Joel Kinnaman) – a loving husband, father and good cop doing his best to stem the tide of crime and corruption in Detroit – is critically injured in the line of duty, OmniCorp sees their chance to build a part-man, part-robot police officer. OmniCorp envisions a RoboCop in every city and even more billions for their shareholders, but they never counted on one thing: there is still a man inside the machine pursuing justice. The original Robocop, released in the late ’80s, is a cult hit; a brilliant combination of engaging sci-fi and social commentary. It is a movie that fully embraces its campiness, and seeks to be entertaining above all else. The 2014 remake of RoboCop, starring Joel Kinnaman, Gary Oldman, and Michael Keaton goes in the other direction, and chooses the route of the self-serious and thought provoking. Well, it tries to anyway. What RoboCop really ends up delivering is a fairly generic remake that’s as inoffensive as films can be – it’s an action film without any teeth, but one that is by no means unwatchable. RoboCop (2014) focuses on detective Alex Murphy (Kinnaman), a well-to-do detective in the Detroit PD who sees corruption all around him, and does his best to carve a golden path. Unfortunately, Murphy’s self-righteousness catches up with him and a “freak accident” nearly takes his life. Luckily it doesn’t, making Murphy a perfect candidate for a new program at the less than honorable company of Omnicorp. The program puts the remnants of a man into a machine and turns Murphy into RoboCop. There’s also a sub plot involving domestic conflicts and America’s reluctance to deploy robots to quell those conflicts, which centers on Omnicorp’s CEO Raymond Sellars (Michael Keaton) thinly veiled attempts to protect while also netting his company huge profits. It’s a side story that follows a very rote formula – seemingly honorable businessman sets out with noble goal, gets power hungry, and then things spiral out of control – and only manifests in that way to give RoboCop a clear cut bad guy. That said, Keaton gives his all to the role of Sellars, and truly sells all the dynamics of his character. Right behind Keaton, giving his all to the role of Dr. Dennett Norton – the true genius behind RoboCop’s construction – is Gary Oldman. Oldman has never been one to shy away from embracing a role, and that is no different here. 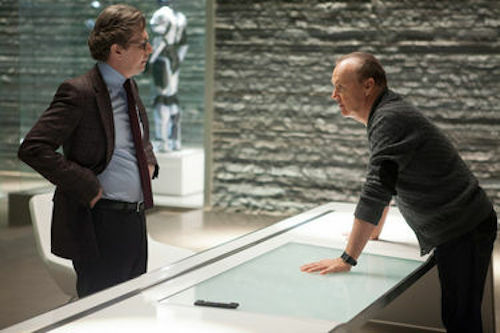 As Norton struggles with his decisions to move away from his original vision for RoboCop by making him more machine than man, Oldman shows a tremendous amount of conflict. In fact, across the board you could say that the casting in RoboCop is top notch. Kinnaman is great as RoboCop/Murphy, balancing the lifeless stoicism of RoboCop with flashes of personality (albeit with a little less charisma on the human side), and his supporting cast make the various sub plots watchable at the very least. Ultimately, the film lightly touches on concepts like free will and safety versus control, but it does so without jumping headfirst into the pool. The film treads lightly at almost every turn, leaving the audience to fill in the blanks on a lot of the bigger questions, or give those questions deeper meaning. Similarly, the addition of the human element, highlighted by Murphy’s relationship with his wife and son, is thrown in not to give the character an additional dynamic, but because without her the film would lack any positive female character. At best, the addition of the wife character as one of the few who see Murphy slowly lose control and become a laser-focused, criminal-hunting machine ticks a box. And at worst it feels like a forced plotline with a poor resolution. 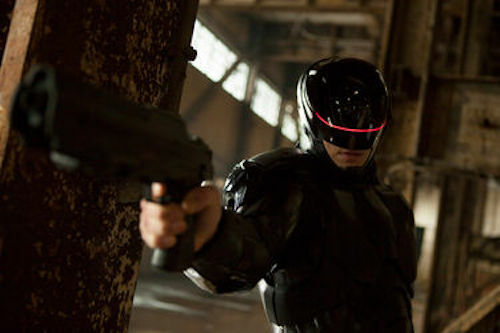 RoboCop is by no means unwatchable, or even a bad movie. It gets by with a genuinely intriguing premise, and delivers a competent story, fun characters, and some middling action. For all intents and purposes, RoboCop is a “fine” movie – a remake that takes few chances to re-mold or evolve the original film’s core concept. It’s only genuine feather ruffling stems from the design of the suit, which starts out as the iconic silver metal but then becomes a less interesting jet black. Tactically, it makes sense, but if the film was going to work this hard not to stir the pot, why not actually stay true to the source material? We detest remakes because, a lot of times, they are shameless attempts to capitalize on a name without considering what makes the original standout as a classic. RoboCop (2014) knows what makes the original film great, but pulls in those elements in calculated doses just enough to be mildly entertaining, but not on the level that makes the film memorable in any way. 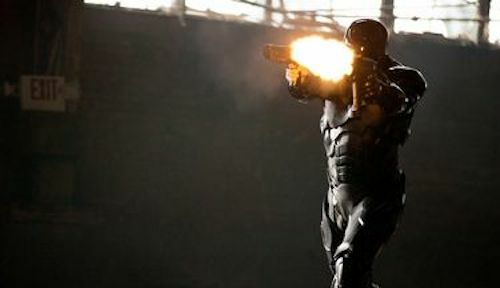 Vanilla filmmaking at its finest, RoboCop lacks teeth, but audiences looking for a mindless distraction will enjoy it. First and foremost, you shouldn’t go into RoboCop with the expectation that this is an action movie in the vein of something like Iron Man. RoboCop is a blunt object, a machine built for taking a beating. He’s not tactical, which leaves little room for interesting choreography or stunt work. Instead, a lot of the action scenes consist of dull shootouts: miserable cacophonies of loud noises and bullet fire. And when the action does get exciting it’s usually a scene between an unconvincing CGI version of Robocop and other forms of fully CGI nonsense. When not in any sort of accelerated motion, the effects work is great in RoboCop, but unfortunately that means all of the action scenes are either hard to follow, straight forward and uninteresting, or filled with too much shoddy CGI to be exciting. The whiz-bang of it all is, again, passable, but not enough for the film to be labeled a great action flick. Rather, it gets the job done with some flashes of creativity, and mostly formulaic work everywhere else.